Prime Minister Theresa May refused to budge from her position on Brexit yesterday, brushing aside criticism from all corners of the UK parliament and saying her strategy was already being negotiated with the European Union. After narrowly escaping defeat in parliament over her plans for leaving the EU, May signalled she would not drop a proposal on Britain’s future relationship with bloc – the biggest shift in its foreign and trade policy for almost half a century. But by sticking to her plan for a “business-friendly” departure that would keep Britain in a free trade zone with the EU for manufactured and agricultural goods, Mrs May has thrown down the gauntlet both to backers of a cleaner break with the bloc and those who don’t want to leave at all. Since the plan was unveiled, Brexit supporters and pro-EU lawmakers in her party have been at war with each other and in some cases with Mrs May. Brexit supporters complain the plan means swathes of the British economy would still be subject to rules set in Brussels. Pro-EU politicians complain it would still leave Britain facing complicated customs procedures and outside the free market for services that make up most of its economy. At a session of parliament, Mrs May stood firm after being challenged by one pro-Brexit MP in her party to explain when she had decided to change her catchphrase from “Brexit means Brexit” to “Brexit means Remain”. “Brexit continues to mean Brexit,” Mrs May said to cheers from the Conservative benches. At a later meeting with her MPs, senior party officials said Mrs May was welcomed. One minister said – on condition of anonymity – the Conservatives had come to their senses and were backing her Brexit plan. But that did not stop Boris Johnson, the former foreign minister who quit last week over Mrs May’s plan, from renewing his call for government to rethink it, saying “it is not too late to save Brexit”. Mrs May said talks had already started with Brussels based on the proposal, set down in a policy document last week and referred to as “Chequers” for the prime minister’s country residence where its terms were thrashed out. 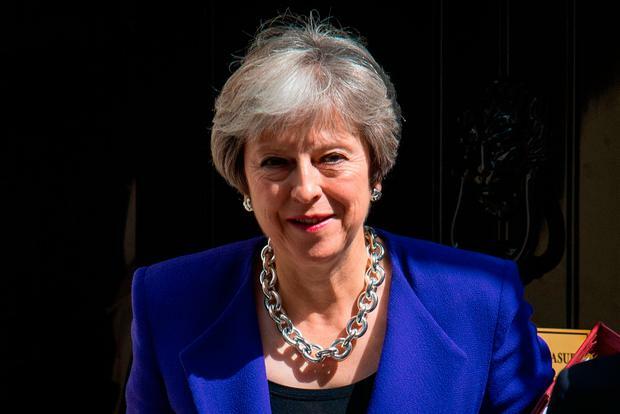 The prime minister insisted she was confident Britain had enough time to negotiate a deal with the EU before leaving in March next year, and denied suggestions Britain was moving closer to a “no-deal” Brexit. Mrs May would face a leadership challenge if 15pc of Conservative MPs wrote letters calling for one. But many of them fear that would bring down the government and force an election, which could be won by the opposition Labour Party and its left-wing leader Jeremy Corbyn. In a sign of Conservative parliamentarians falling into line, one of them, Simon Clarke, told the party meeting that he had submitted such a letter but was now withdrawing it for the sake of party unity. “We’ve looked into the abyss in the last few days,” he said outside the meeting. Mrs May’s vulnerability in parliament, where she lost her majority in an ill-judged election last year, was laid bare on Monday and Tuesday when she faced rebellions from both the pro-Brexit and pro-EU wings of her party. Mr Johnson, figurehead of the Brexit campaign in the 2016 referendum, urged Mrs May to change her Brexit strategy in a scathing assessment of the government’s handling of the negotiations. “We have time in these negotiations, we have changed tack once and we can change again,” he said in his resignation speech to parliament yesterday, more than a week after he quit.